Dedicated collector Steve Patterson has completed the 77 card series of Helmar Die Cuts. He is offering it for sale; you can contact him below. Previously Steve completed and sold a complete set of the E145-Helmar cards. Congratulations, Steve! With images of six players inset. 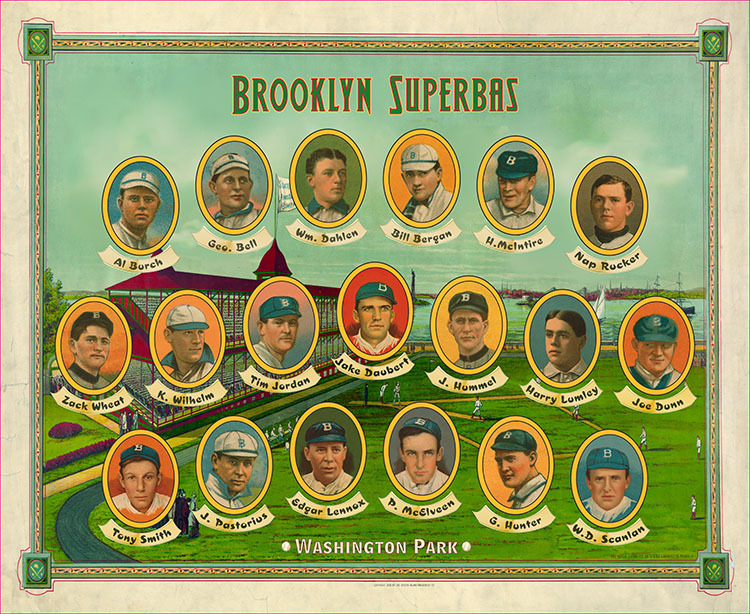 This is part of a series of Big League teams from the same era. The size is great for display at 22″ x 18″. Each player portrait is matted with a die-cut gold border. They are very thick and substantial. More later! After the text you’ll find an image of the card along with a couple of great photos that relate (sort of). I love making these die-cut cards, which are essentially very thick postcards. They are each about 6″ x 4.5″ and the five layers add up to 3/16″ of an inch thick. It makes for a substantial piece, something that could probably crack a window in a moment of pique. In future postings I’ll describe the series in greater detail but today I’d like to focus on one particular card. Ed Foster, Charleston Sea Gulls. Called “Slim”, Foster graduated out of this “C” level league several times, only to regularly drift back. His high point came in 1908 when he pitched in six games for the Cleveland Americans. In that short stint he went 1-0 with two saves and an excellent 2.13 ERA. Perhaps he injured his arm because it doesn’t appear that he played at all in 1909. 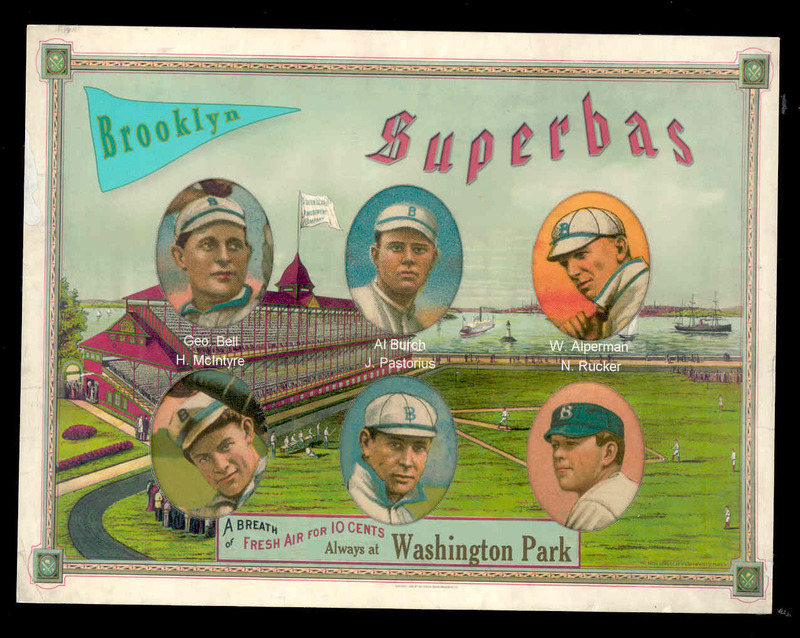 By 1910 he was back in the minors and, though he won 20 for the New Haven Prairie Hens (gotta love it), he never managed to appear in another big league game. Slim played, often quite well, through 1923. He passed away in Montgomery, Alabama, in 1929. He was 43 years old. Joe Jackson, Savannah Indians. Joe was 21 when he played for Savannah, batting .358 over 118 games. Savannah was a fast growing city at the time, boasting a population of 68,000. Traditionally a cotton center, paper mills and an iron forge had transformed Savannah into one of the largest cities in the south. John Kiernan, Columbia Gamecocks. John is one of those players that history should know more about. Though he never played in the majors, he did spend eight seasons as a professional ballplayer (lifetime .245 average). We don’t know where or when he was born or died. Since most of his career was with East Coast teams, I would guess that was where he originated. He last played for the Fall River (Mass.) Spindles in 1914. This mystery man does, however, make another appearance in baseball –managing the Haverhill Hillies (again, in Mass.) from 1926 through part of the 1928 season. Ernest Howard, Savannah Indians. Ernest played 14 years in the minors as an outfielder, compiling a .252 lifetime average. He started his pro career back in 1902, toiling for the Baton Rouge Cajuns. That was low “D” ball. Unfortunately, it wasn’t until his tenth year as a player that he graduated to the “B” level (with the Fort Worth Panthers). Whatever he lacked on the field, Ernest must have been well regarded as a man because he was chosen to manage the Savannah club for part of the 1909 season. Nothing is known of him after he left the Beaumont Oilers team following the completion of the 1915 campaign. Still, the man will always be remembered (or wondered about) due to his T206 card. And, hopefully, this die-cut card. Cadwallader (Cad) Coles, Augusta Orphans. Cadwallader is a name of Welsh extraction. It is such an unusual name that I just had to look it up. Anyway, Cad did make the majors, sort of, when he hooked onto the Kansas City Packers of the Federal League in 1914. He’s another player that had trouble getting out of the low minors though his lifetime average was .276 over nine seasons. Juan Violet, Jacksonville Tarpons. Juan was born, I believe, in Cuba and was one of the better known outfielders there. He played ten years in the American minor leagues and compiled a .212 lifetime average. He must have loved Jacksonville, seeing as how he played seven of his ten seasons there. In May, 1901 the city, which was the largest in Florida with a population of 28,000 (over 16,000 of these were black Americans, largely doing menial work and living in poverty), was decimated by a fire that took out most of the downtown area. Undaunted, Jacksonville rebuilt and reinvented itself, doubling in size by 1910. Violet arrived in the middle of this excitement (1904) and did not leave for good until 1911. It is possible that he returned after his playing days were over.